• 4 jack rings for easy lifting by crane. • Reinforced roof and frame profile. • Liquid collection channel on all four sides, apart from the door area. • Integrated, weather protected ventilation openings in the door and opposite back wall. • Container’s door options include single and double side and end doors or a combination of both. CHEM 1000 7’x 7’WITH DOUBLE SIDE DOOR SUMP CAPACITY 800 litres. CHEM 1000 7’x 10′ WITH DOUBLE SIDE DOOR SUMP CAPACITY 1060 litres. CHEM 1000 7’x13’ WITH DOUBLE SIDE DOOR SUMP CAPACITY 1425 litres. CHEM 1000 7’x16’ WITH DOUBLE SIDE DOOR SUMP CAPACITY 0000 litres. 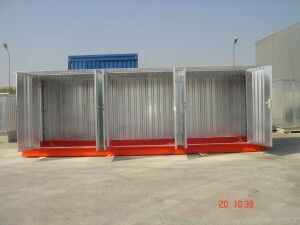 Made of 3mm steel sheeting, hot-dip galvanized. Load bearing capacity 1000 kg/sq. meter, higher capacities on request. The collection volume is 10% of the total storage volume. A large or small ramp. And many other useful accessories. Delivered pre-assembled, ready to use or flat packed for ease of shipping.